One question we get asked about a lot at TMSM is where guests can find a decent breakfast on the fly while on Disney Property. Well, the Disney Parks Blog offered up some suggestions, so I thought we’d share them with you! Here’s what they had to say! 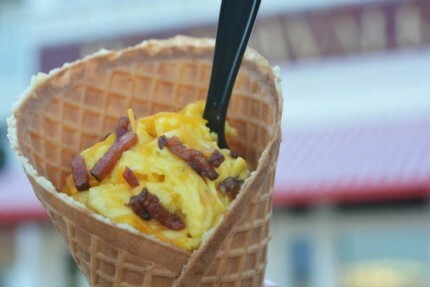 Fluffy scrambled eggs, crispy bacon, melted cheddar cheese in a hand-formed maple waffle cone makes this a BoardWalk breakfast not to be missed. Try a fun twist on a childhood favorite with an egg, bacon and cheese breakfast sandwich served on a strawberry Pop-Tart®. Who says you can’t have pizza for breakfast? This flatbread is topped with scrambled eggs, sausage gravy, crumbled bacon and cheese. Get a hearty breakfast before Soarin’ with eggs, bacon, roast pork and cheese on a pressed panini, served with breakfast potatoes. Get your veggies in early with cauliflower, spinach and paneer cheese served on naan bread. What is your favorite quick-service breakfast at Walt Disney World Resort? Let us know in the comments below!